A palette is an ordered set of colors and associated method of interpolation. There are several ways to start the Palette Editor, a tool in the Utilities category. In addition, clicking a palette well (analogous to a color well but rectangular rather than square, such as used for a gradient in the Background preferences) opens the Palette Editor. Brewer, Cynthia A., 2011. http://www.ColorBrewer.org, accessed 19 May 2011. 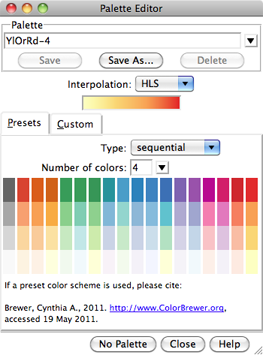 The Custom section provides a user-specified number of color wells (up to 12) for defining a new palette. Clicking a color well brings up the Color Editor for interactive color definition. The colors together with the method of interpolation comprise a palette. Palettes can be named, saved, and later retrieved from the pulldown list indicated by the black inverted triangle near the top of the dialog. A built-in palette (Chimera default or any of the presets) cannot be overwritten or deleted, but it can be saved to a new name. Custom palettes are saved in the Chimera preferences file, and are only updated with any changes when Save, Save As, or Delete is used. The Help button brings up this manual page in a browser window. Close dismisses the Palette Editor.